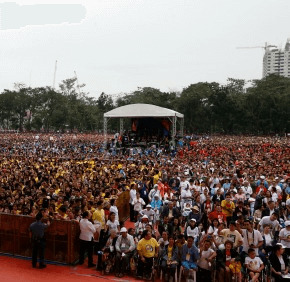 MANILA, Philippines – Young people drew inspiration from an encounter with Pope Francis at the University of Santo Tomas. Rain started to fall the moment the pope took the stage before a sea of young people in bright-colored T-shirts, but the 30,000 students and youth leaders remained rooted in their sections, listening to the pope urging them to cry, to love and to think, feel and act. Csherina Sanchez said she was inspired by his words. Father Mark Anthony of the Diocese of Virac equated crying with empathy. As Pope Francis arrived his popemobile, young people ran from one corner of the sports field to another, trying to keep pace with the beaming pontiff. Celine Villarin, 19, a member of the Student Catholic Action of the Philippines, said she could not find the words to say why the pope makes such a huge impression. “I don’t really know, but there is something really magical in him that when you see him, goose bumps are really felt all over you,” she told CNS.